Standort: 2.2.1.11.4: Bjoern Project 01.07. . 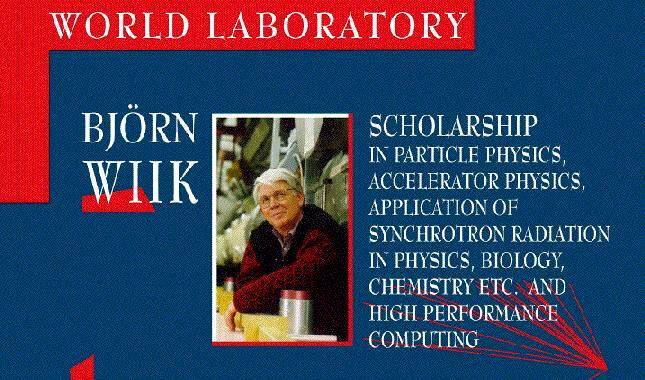 The ICSC-World Laboratory invites application for scholarships named in honor of the late distinguished scientist Björn Havard Wiik which will be awarded to young scientists for research and training purposes, in the fields of High Energy Physics, Accelerator Physics and Technolgy, Applications of Synchrotron Radiation and High Performance Computing. Experiments with synchrotron radiation at the Hamburg Synchrotron Radiation Laboratory HASYLAB at DESY with photon beams of 1 eV - 300 keV in the fields of solid state and surface physics, chemistry, biology and medicine. Development of High Performance Parallel Computers and their application in particle and accelerator physics and other basic sciences; this work is based at DESY Zeuthen. Most activities are performed in the frame of international collaborations.